Recipe: The Natural Baker by Henrietta Inman. Published by Jacqui Small, an imprint of The Quarto Group (£20). Out now. Preheat the oven to 180°C / 350°F / gas mark 4. Butter the sides and base of a 20 cm (8in) loose-bottomed cake tin (pan). Line the base with baking parchment. In a freestanding mixer fitted with a paddle, or using an electric hand whisk, or by hand, cream the butter, sugar, and 30g (1oz / 2 tbsp) of the cordial until light and fluffy, stopping the mixer now and again and scraping everything off the bottom of the bowl once during this time. Separately whisk together the flour and baking powder. Now return to the butter mixture. While mixing, add 1 egg at a time to the creamed butter and sugar, alternating each addition with one-third of the flour mixture, finishing with the last one-third of the flour mixture. As soon as the batter come together and looks smooth, stop. Turn the batter out into the prepared tin (pan) and bake for 25-30 minutes, rotating the bake halfway through, or until the top is golden brown and a skewer inserted in the centre comes out clean. Remove the cake from the oven, pierce it all over with a skewer, then pour over 60g (2oz / 1⁄4 cup) of the cordial. Leave to cool on a wire rack. Whip the cream to soft peaks and fold in the remaining 30g (1oz/ 2 tbsp) elderflower cordial. Once the cake has cooled, cut it in half horizontally, then fill with the rose petal jelly and half the cream. Put the top on and finish with the remaining cream. 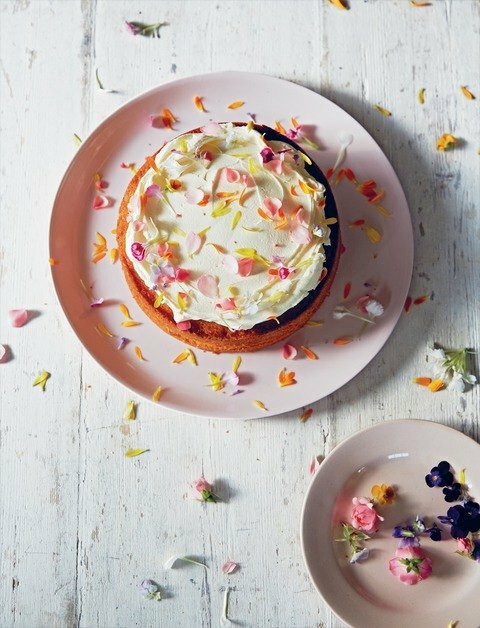 Decorate with edible flowers such as rose petals or elderflowers, if you like. Keep any leftover cake in the fridge for about 5 days, letting it return to room temperature before serving.